Emeryville is located at the geographic center of the Bay Area. The city has seen a remarkable transformation in the past 20 years—from an industrial center with decaying buildings and contaminated sites, to a dynamic center for regional commerce. The new General Plan seeks to guide the next era of Emeryville’s development—as a livable, sustainable, urban community. The plan emphasizes mixed-use neighborhoods and walkability, with all residents within a five-minute walk of neighborhood commercial amenities and open space. The city will be knit together by new and “complete” streets with character-based typology, and a multi-modal transportation system. The plan triples the amount of open space, identifying two new large parks, pocket parks, and plazas, and a system of greenways and green streets. Emeryville will have the highest employment density of any Bay Area city (25,000 jobs per square mile), and overall population density (14,000 people per square mile) rivaling that of San Francisco. The plan includes Urban Design and Sustainability elements, and a detailed Implementation Program. 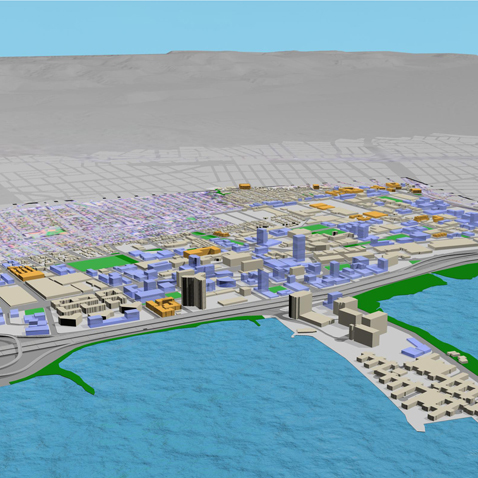 Extensive community outreach, a 3-D computer model of the entire city, photo simulations for major transition areas, and GIS-based walkability analysis accompanied plan preparation. 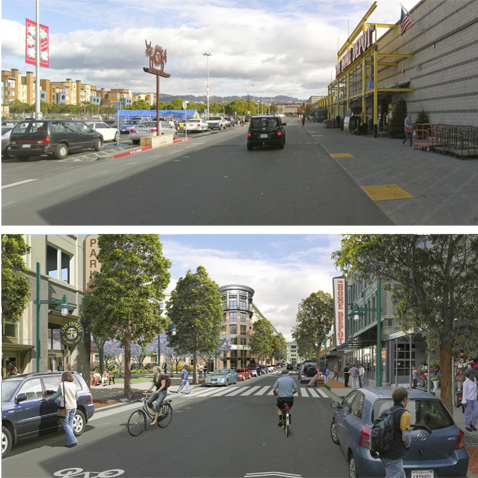 Following General Plan adoption, D&B also prepared citywide design guidelines, which further Urban Design Element’s policies of community-oriented development.